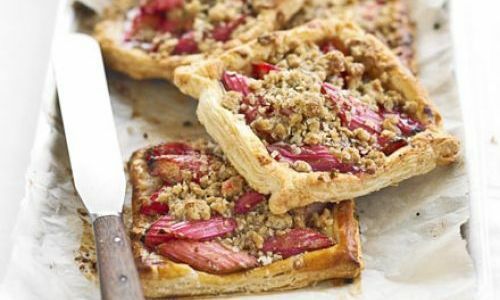 In a bowl, toss the rhubarb with cinnamon, 1 tbsp flour and 3 tbsp sugar. Line a baking sheet with a piece of baking parchment. Roll out the puff pastry on a floured surface to approx. 20 x 30cm, then cut into quarters and place on the baking sheet. separately, rub together the remaining flour, sugar, butter and oats to make a rough crumble mixture. Divide the rhubarb mixture between the pastry quarters, leaving a 1cm rim on each side. Sprinkle the oat mixture over, then fold and pinch each corner to keep the filling in.